Go fishing with an experienced captain! Cedar Key Tranquility and Serenity in Cedar Key are the names of our Cedar Key vacation rental by owner condos on the island of Cedar Key, Florida. We named our Cedar Key vacation rentals after the serene and tranquil views of the Gulf of Mexico and the backwaters of Waccassassa Bay. We are #BookDirect VRBO properties. No “service fees” added. Our two bedroom, two bath Cedar Key vacation rentals located in the Fenimore Mill Condominiums offer incredible views of Waccasassa Bay and the Gulf of Mexico from the living area, kitchens, and private balconies. Our vacation rentals are located within easy walking distances to most everything on island. City park and beach are 1/2 block. The marina is 1 block and dining on Dock Street and Second Street is 2-3 blocks. The island grocery market is about 4 blocks away. We usually park our car and walk or ride a golf cart when we are visiting Cedar Key. It’s a lovely, small and quaint island city and you’ll miss most of it if you drive on by! Cedar Key Tranquility is a two bedroom/two bath rental condo with a king bed in the master with an en-suite bath and a queen bed in the guest bedroom with a bath across the hall. The condo is designed for low key elegance and the balcony views are superb. The condo is a corner unit and has the feel of a treehouse – private and above it all. We offer quality high speed WiFi, streaming media, free US/Canada calling via VoIP, a printer/fax and a great spot to work if you need to. View Tranquility’s Availability Calendar. Family friendly, Cedar Key Serenity two bedroom/two bath rental condo a king bed in the master bedroom and a convertible sofa (double bed) and child chair/bed in the loft bedroom. Casually, but tastefully, furnished in wicker, soft colors, and serene artwork, our vacation rental condo offers affordable and comfortable lodging. Cedar Key Serenity offers streaming media, free US/Canada calling via VoIP, high speed WiFi and work space with a view. View Serenity’s Availability Calendar. If you’ve always stayed in conventional lodging, we invite you to stay in our Cedar Key vacation rentals. 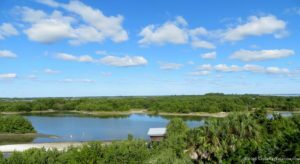 We offer the qualities of home with a spectacular view of Cedar Key sunrises, sunsets and the incredible bird life. 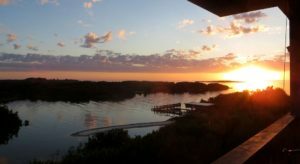 Our northeast-facing balconies offer stunning views of small mangrove islands, Wacassassa Bay and the Gulf of Mexico. Enjoy coffee on the balcony with the views of Cedar Key’s shorebirds, fishing boats, kayaks, and the ever-changing sea and skies. Launch your kayak, play in the sand or catch a few rays! Enjoy our heated pool and our hot tub. Use our private fishing dock to catch some trout. To see what’s new in Cedar Key, FL and our Cedar Key Vacation Rentals – checkout our Facebook Page! Please note that both of our vacation rental condos are on the third floor and have no elevator. We are not handi-cap accessible.